Overload, overload, overload, overload! The social networking arena is already so amazingly saturated and dense that it feels if you pour one more weensy drop, something else will drip. And Instagram has just added additional droplet into this sizzling virtual potion. Facebook’s image-based social service (one of its two) decided that the mobile-app biosphere isn’t copious enough anymore and announced on augmented user profiles which will now be available on the Web. 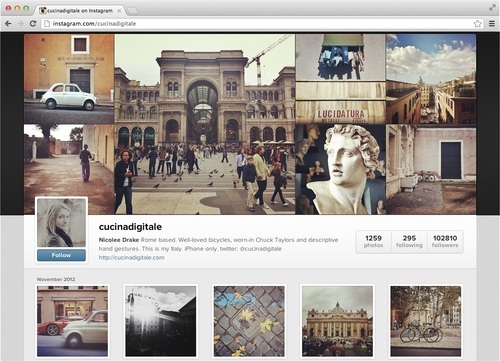 To try it, just type in the URL box instagram.com/username. If you don’t see it yet, just stay patient and wait a few days until the changes implemented to all users. Even though it’s essentially just a small step, it seems to indicate on how Instagram grasps high ardors far and beyond a mobile photo-sharing app. When considering that on the last public head count Instagram surpassed the 80 million members (back in July), it only natural to desire sprawling out into the Web to attract more users and to please the service’s current ones. The new Web profile itself mostly accentuates (unsurprisingly) the user’s photos. On the top of the page, there’s a quite beautiful auto-changing gallery of the user’s recent photos. Below, there’s the user’s details (thumbnail, bio, number of photos, following and followers) and under that the photos plainly being displayed in chronological order. I won’t worn you with the never-ending comparisons to other social networks’ profile design, but I will only say that I like it. As an image-based service the profile reflects exactly what it was supposed to, the visual contents of the user without too many distractions. The Web profile page can’t be opted to private, but users can choose to set any photo they want to private so only people they choose will be able to see them. Whether if the photos are public or private, search engines don’t have access to index them (the directory where the photos are hosted is blocked by the robots.txt file if you’re interested in the technicalities). At the moment, there’s no option to sign up for Instagram through the Web, only through the iOS/Android apps. However, I suspect that rather sooner than later we’ll eventually see Instagram opening its registration gates to the Web as well. Just a hunch. I want to end as I have begun, pondering about the thickening of the social media. For me at least, it’s not a question of if we have enough elbowroom for all social networks, but which social network will ooze out when we’ll actually reach to the watershed line.